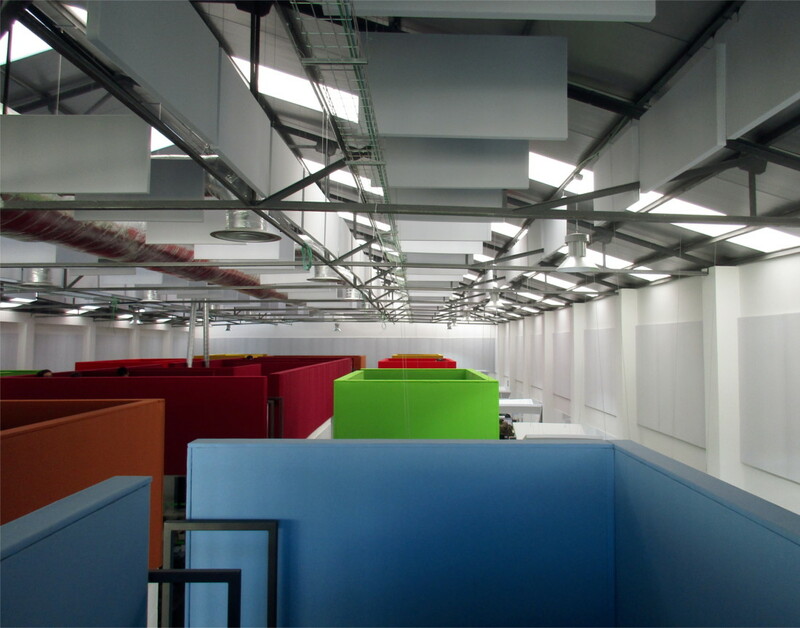 The role of the architect when designing the architecture office project for na IT company ( Information Technology ) is absolutely crucial. 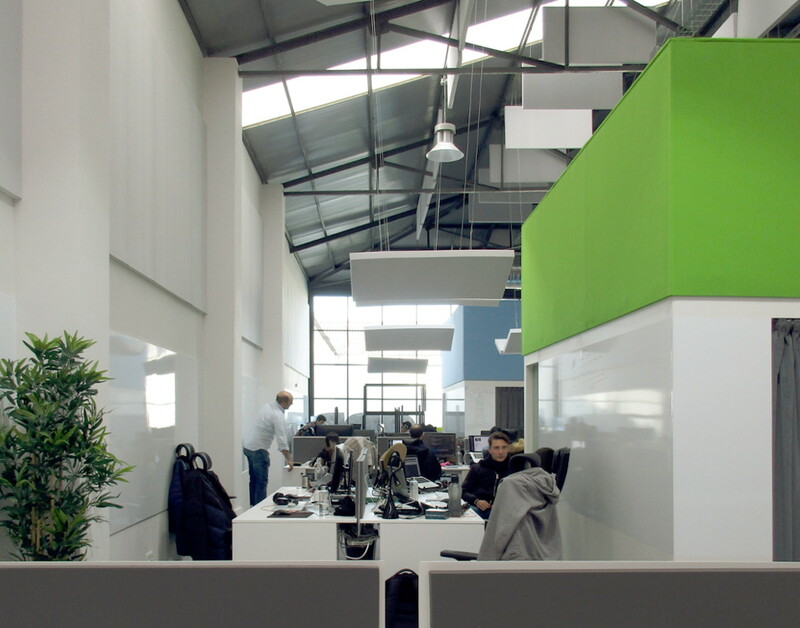 The main objective for the architect is to create a space that promotes creativity along with productivity. In the Xing Porto office project we had the opportunity to develop a work that is born from a profound exchange of ideas between the designers and the client. 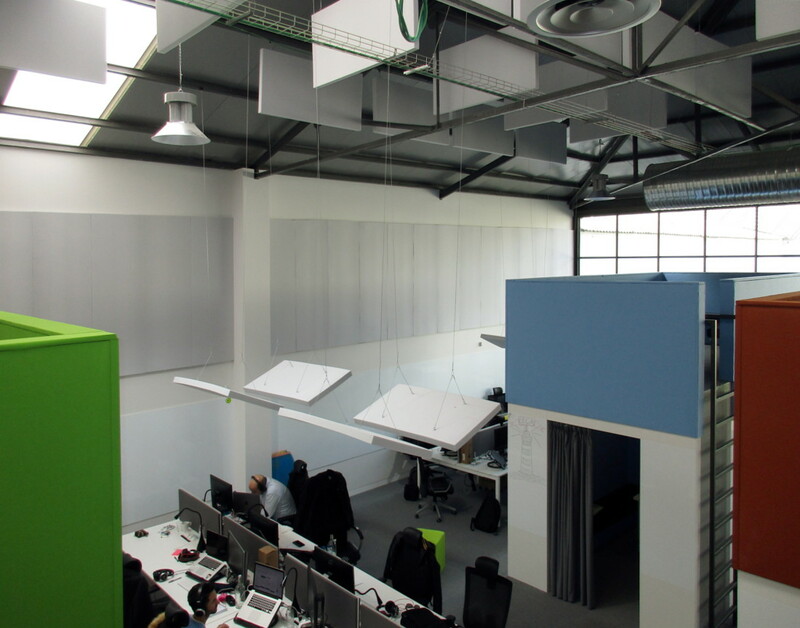 Located in a former warehouse in Matosinhos, near the main Porto city park, we try to challenge our programmers, promote their creativity, support productivity, create flexibility, generate thermal or acoustic comfort and support environmental sustainability. 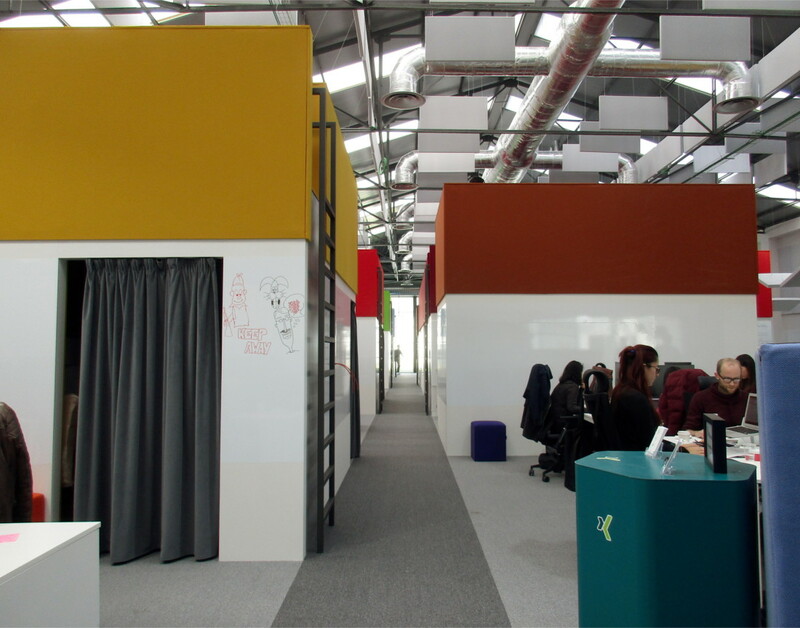 Extraordinary companies like Xing need bold projects that challenge stereotypes and focus on providing the best space to work. 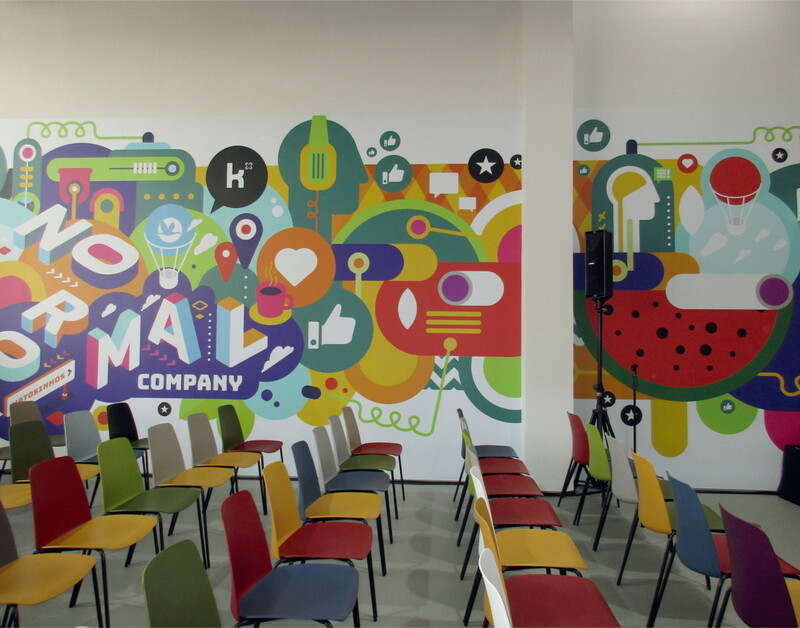 The walls are all covered with areas for writing. The fundamental infrastructures are visible showing symbolically that we resemble to factory of great ideas. 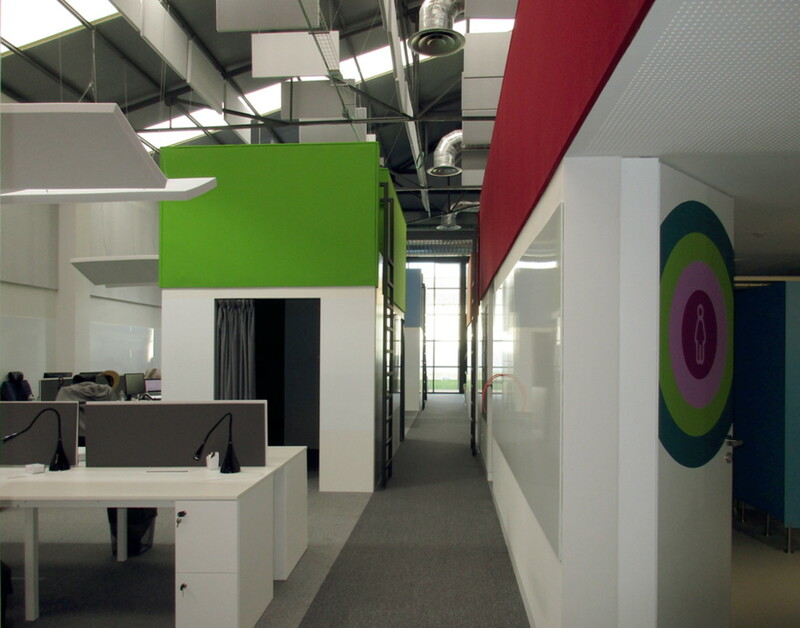 We like to show that the contemporary work space is an open project where each employee can contribute. We create architecture for people, not for magazines. 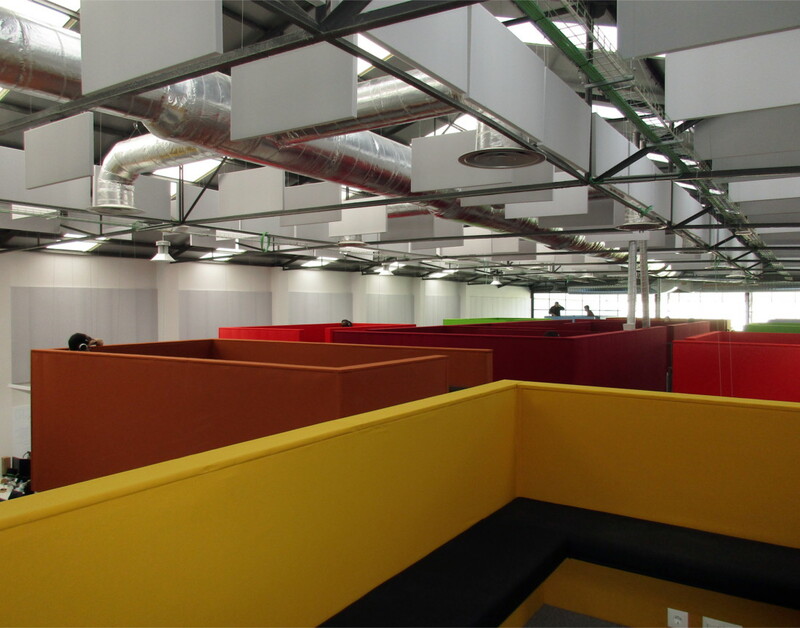 The premises were to make a space that was able to incorporate in perfect comfort 130 employees. 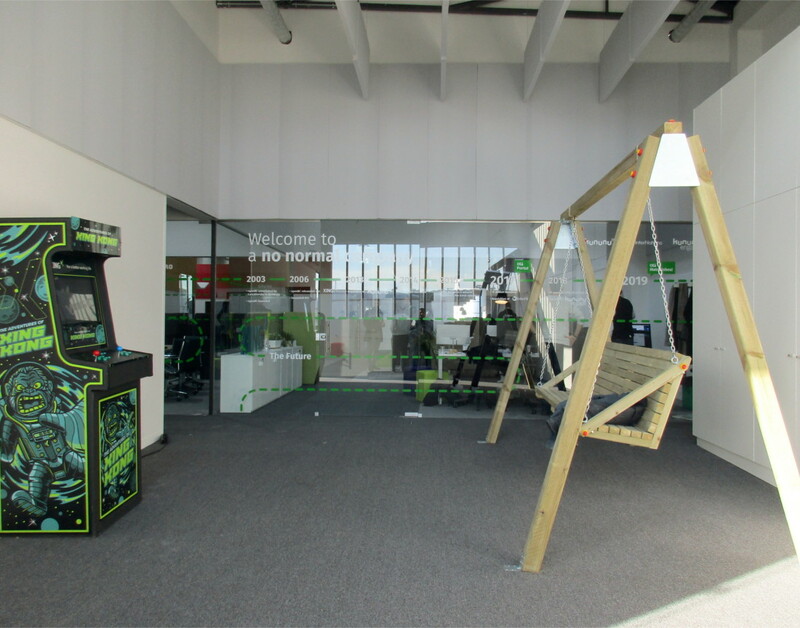 It was necessary to equip a reception to visitors with games, swing, bathrooms and access to kitchen, meeting room, conference room and server area and security. 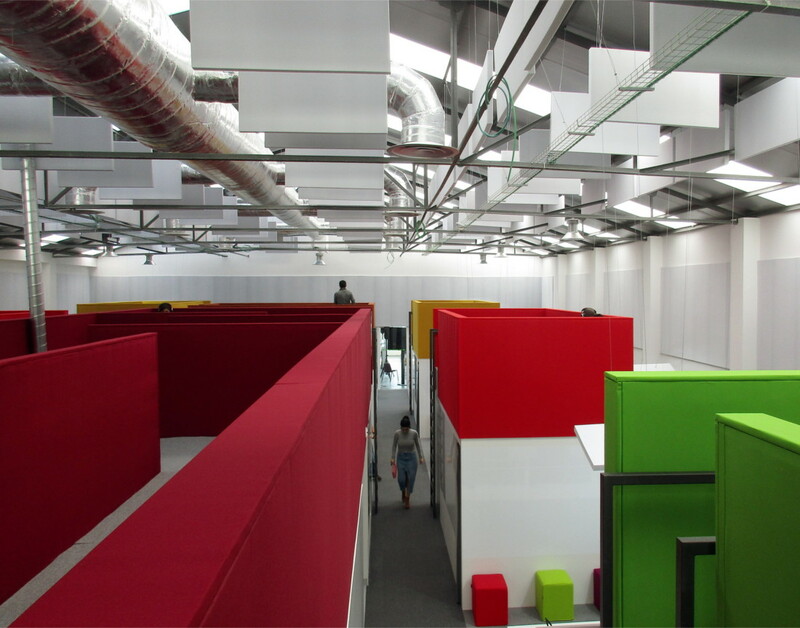 The remaining area has conditional access and incorporates workstations in groups, enclosed meeting rooms, video conferencing booths, informal meeting areas, and relaxing areas in the roofs. In the backyard we also have a green space for recreation and rest. Everything is thought to be adapted. Work groups can be made of two, four or eight programmers. 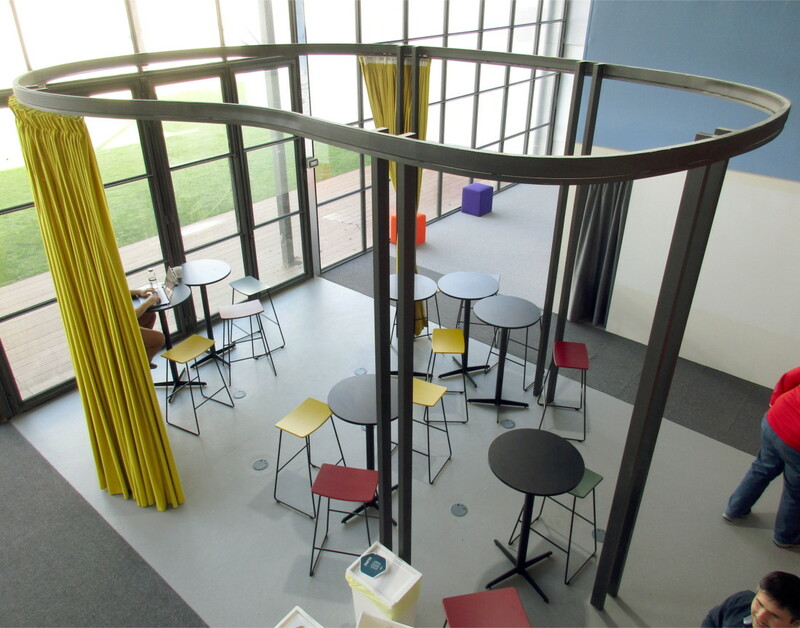 Furniture such as sofas or tables can be transported and generate different configurations. The conference room can also be a dining room. The tea zone works closed or open, according to the moment necessity. In the closed spaces we can talk or work, gather or reflect. Corridors are also meeting space for sharing ideas. The architecture is moldable, it is above all a support for flexible uses. 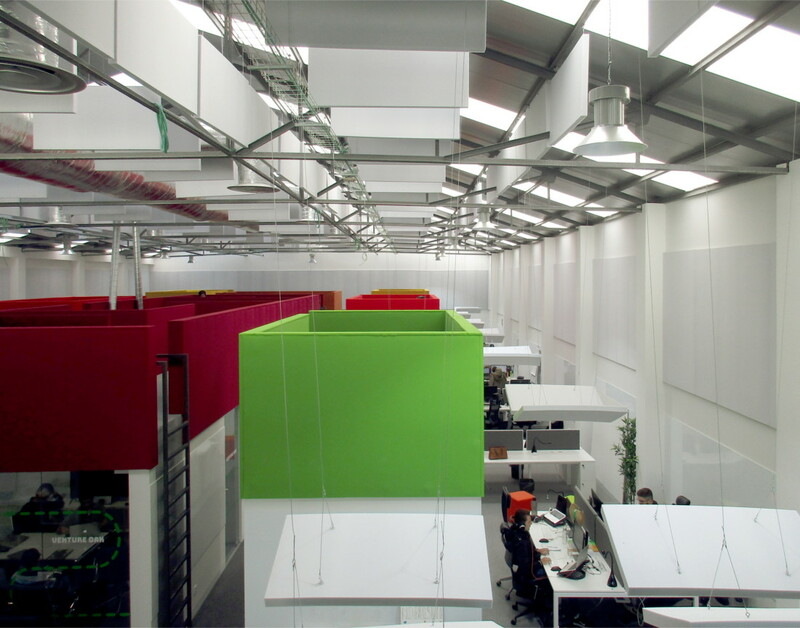 Acoustic comfort is a commitment we take very seriously. 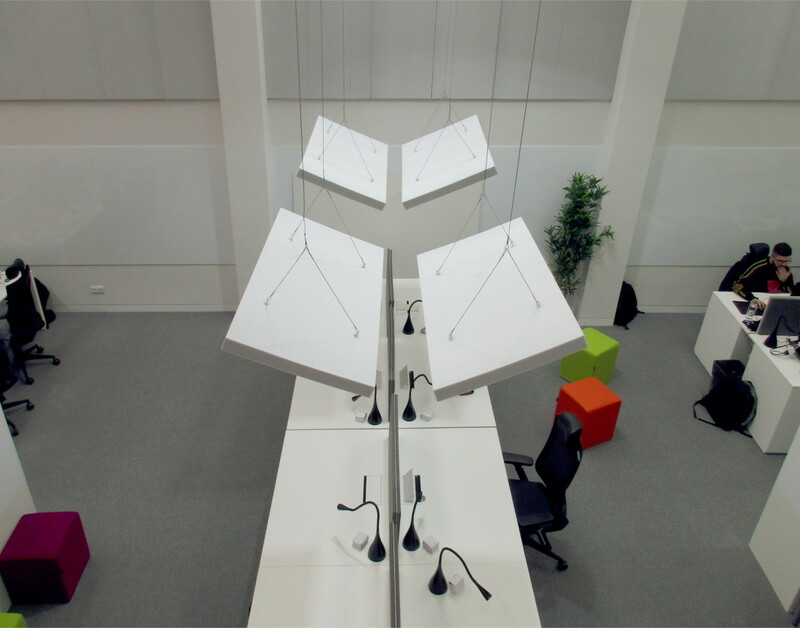 Through specific technical solutions we reduce the air sounds and percussion noises to a minimum, allowing perfect comfort for the teams in the open-space and absolute silence in the meeting areas. We dimension the air conditioning equipment to reduce airflow to a minimum and comfortably air-conditioning a volume of approximately 10 000 m3 of air. We have a commitment to sustainability. 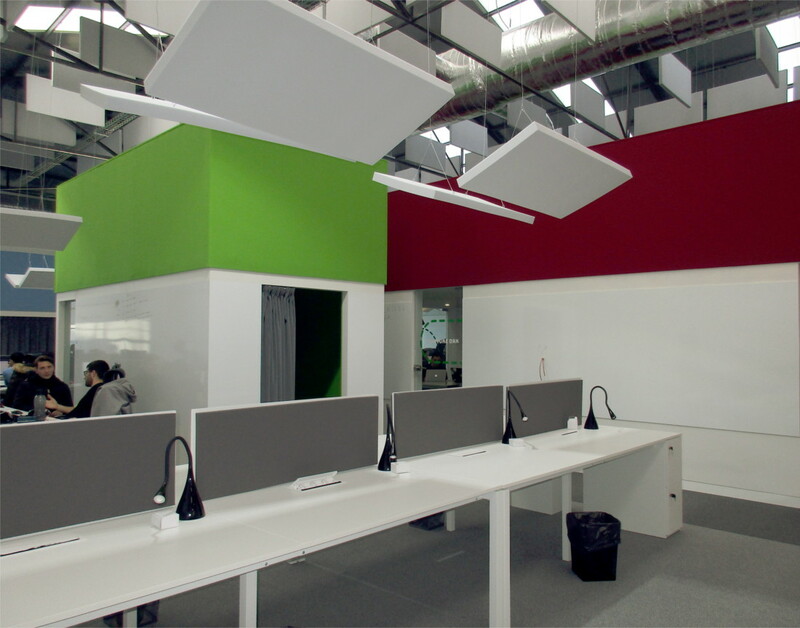 We seek to maximize natural light by placing the acoustic panels in a way that is compatible with the cover openings, allowing for long hours of savings with the use of natural lighting along with local artificial lighting in the work area. We believe in the importance of challenging everything and everyone. Keeping the curiosity of childhood along with the responsibility and autonomy of the employee is a challenge that we like to promote. We take advantage of all the roofs on the meeting spaces and videoconference in order to offer spaces where we find total freedom to move away from work: sleep, rest, read, think. We believe in the importance of providing spaces with the possibility of including the diversity of behaviors and personalities. We seek to include both open spaces and closed areas, generate both bright places and dark places, top-down or bottom-up views, etc … Basically, it is the guarantee that we can include different generations and different perspectives of life, expansive personalities, demure, sporty or relaxed, in short, all the diversity that makes us better.